LOS ANGELES–SparqEE brings you the first cellular development platform introduced on Kickstarter, the SparqEE CELLv1.0! 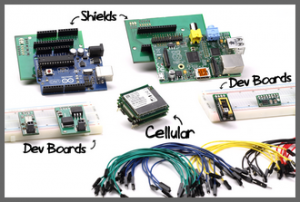 Launched on Kickstarter August 20, 2013, the CELLv1.0 is a tiny Cellular dev board that gives makers, hackers, and developers worldwide wireless internet access to your projects. 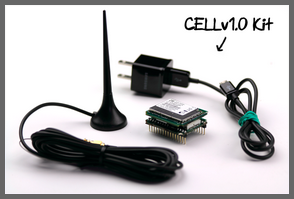 Previous Kickstarter projects have provided usable, open source Bluetooth and WiFi technologies, but the SparqEE CELLv1.0 is the first to offer cellular. What may be even more important than the hardware options is that SparqEE also provides an ecosystem for the CELLv1.0 that gives free access to their servers. Along with the easy-to-use code, you can immediately send data through the internet cloud to any internet enabled smartphone or computer, from anywhere to anywhere in the world! SparqEE was recently asked about how the cellular providers played into this project: “with M2M applications and anything cellular really, the providers are one of the biggest hurdles. Since our goal is to make cellular as ubiquitous as bluetooth and wifi we needed to take care of everything, including the providers. So we put together a SIM card offering that works anywhere in the world – it’s the easiest to setup, no minimums, and is the lowest cost I’ve ever seen. For example, for a tracking application we’re working on, a worldwide 1MB plan is going to run at about $2/month” – check out SparqSIM product page for more info. For more information on the SparqEE CELLv1.0, visit the Kickstarter page here or feel free to contact SparqEE at info@sparqee.com. There’s also a community help forum available at forum.sparqee.com where you can share your projects and ask for help.